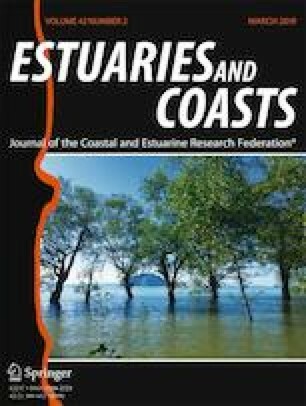 Rainfall, runoff and estuary inflow link catchment conditions to the physical, chemical and biological properties of estuaries. Commercially exploited penaeid prawn species often rely on estuarine nurseries, and thus, the productivity of penaeid fisheries can be enhanced or diminished by catchment conditions. We conducted an initial investigation into changes in the fatty acid composition of school prawn Metapenaeus macleayi following freshwater inflow, under natural environmental conditions. Juvenile school prawns were collected from two south-eastern Australian estuaries during non-flood (normal) and post-flood conditions, and fatty acid concentrations quantified. Total fatty acid concentrations were significantly higher during post-flood conditions, and constrained ordination showed clear separation of samples collected under normal and post-flood conditions on the basis of their fatty acid composition. Docosahexaenoic acid (DHA), docosapentaenoic acid (DPA) and linoleic acid made a significant contribution to the dissimilarity among these groups. There was a significant negative relationship between salinity and linoleic acid concentrations post-flood. Changes observed in fatty acid profiles likely reflect both changes in the estuarine food web, as well as physiological responses to stress. These changes have implications for prawn condition, growth and survival. We thank E. Mitchell, I. Thiebaud, R. Dobson and K. Tyler for assistance in collecting samples, and J. Franks and C. Mcluckie for assistance in other areas. This project was supported by the Fisheries Research and Development Corporation on behalf of the Australian Government (2015/011). Prawn sampling was carried out under permit P01/0059(A)-2.0 and Animal Research Authority NSW DPI 13/08. Parrish, C.C. 2013. Lipids in marine ecosystems. ISRN Oceanography. https://doi.org/10.5402/2013/604045.